Distance 3.2miles/5km - 1½hours. Terrain: A flat walk along field paths, and a quiet lane, potentially muddy in places,with step and squeeze stiles. Introduction: This walk takes you via Burley-in-Wharfedale village green and Burley House (Burley’s only Grade1 listed building), to Burley House Field. From here, pleasant footpaths, which feel almost like a secret escape route, guide you through modern housing and into open country. Burley House has had various incarnations. Built in 1798 by Thomas Maude, a poet, it became St.Philip’s school in the 1940s, then a pub, pizzeria and a corporate headquarters. The neighbouring Burley House Field, once part of the house’s estate still has the remains of a “ha-ha”, which, in times past, would have provided (from the house side) an invisible barrier to prevent livestock entering the house grounds. The 8 acre Burley House Field was the subject of a protracted campaign to have it designated as a Village Green space and Recreational Open Space, starting in 1993. It was finally approved as a village green in 2009. 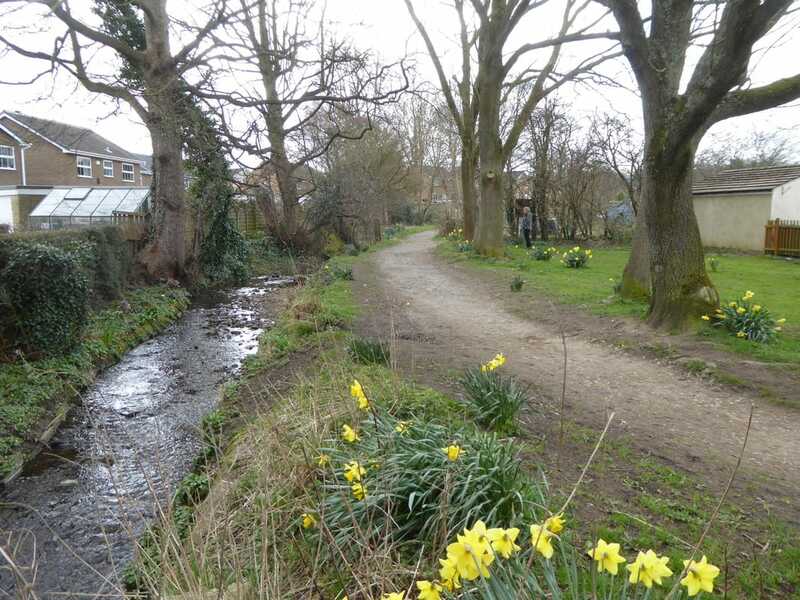 It has been improved with the addition of new bridges, seats and stiles and a Burley Community Orchard has been created with apple, damson, plum and pear trees, planted early in2 014. After crossing the disused and current railway lines, the route takes you across fields with good views, to Hag Farm. It passes within 100 yards of Bleach Mill House. In its grounds are foundation remains of the old bleach mill, which used to bleach fabrics woven in the Bradford mills. The tearoom is normally open during the day and serves excellent cakes! The owners, Sue and Simon Richmond, will show you the mill foundation remains and tell you about the history if you ask.